Iain De Caestecker is on quite the roll of late. Not only is he currently starring in the hit US TV show Marvel’s Agents Of S.H.I.E.L.D. but he has a starring role in new movie Not Another Happy Ending (released on DVD on 10 February) alongside such familiar faces as Karen Gillan from Doctor Who and Henry Ian Cusick from Lost. We caught up with Iain to talk about the movie, his experiences on both US and UK television and his plans for the future. What was it like working on a more ‘local’ project with stars such as Karen Gillan and Henry Ian Cusick? Was there anything in particular that attracted you to the movie? Oh, the cast was definitely part of what attracted me to the project, and of course it was really nice to be back in Scotland! I’d worked with the director before and I was a fan of Karen’s work beforehand too, so it seemed like a great opportunity to me. Luckily it took off well and it was a really enjoyable experience. The character was a lot of fun. It seemed to be quite the unique project with part fan funding through Indiegogo. What was it like being involved in something a little different in the industry? I think fan involvement is an interesting and important movement that is happening a lot more lately. It’s nice to have that because you know that there’s people out there that are supporting you already, not just after the film has been released. The filmmaking experience is still the same really but you’re getting constant attention and feedback from those invested in it. You almost feel a little more responsibility. How was it showing a more comedic side to your repertoire? Did you get a chance to do much improv? Yes! Actually it was nice to do a lot of improv. It doesn’t always work out and some got cut, but John [McKay, director] was certainly open to improv and everyone having their own views on their roles and the script. It’s always really good fun to have that freedom. There’s less pressure there as opposed to darker roles, plus we were all very close friends during and after the shoot so that made it even better. What’s it like working on a large operation like S.H.I.E.L.D., especially a Marvel project that has such a dedicated fanbase? It is a different experience in some ways, yet I really just try to focus on whatever the project is rather than the medium. So whether it’s movies, television or theatre, I look at whatever it is I’m working on. Having something that others are passionate about is always a risk but very encouraging too. It can be intimidating but exciting too. It’s almost strange to see both yourself and Karen Gillan, your co-star in Not Another Happy Ending, now in Marvel projects – you in S.H.I.E.L.D. and Karen in Guardians Of The Galaxy next year. How do you both feel about that? Actually I met up with her the other day. She’s such a character but one of the most genuine people you could ever hope to meet. The level of success will never change her, even if she’s in a huge film like that. She’s a great laugh and she deserves all the success. No matter what the scale is, she will always be Karen. I think we both have that same approach of whatever it is, just deal with it the same. 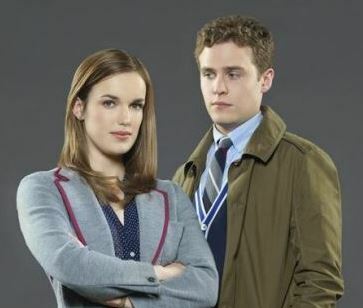 What was it in particular that attracted you to S.H.I.E.L.D. or was it a no-brainer of an opportunity? Fitz is a character I find exciting. I was particularly familiar with his comedic side. Obviously working with Joss who has such a commanding presence and can do comedy and emotional too. Working with Marvel and everyone behind the scenes. They are all fantastic. Such a great team. The storylines that Joss works on – he has a much longer frame that he works to, and lots of planning. In terms of how the show is performing now – have you heard any buzz about a second season? From our own perspective and that of others we have talked to, the show seems to be picking up pace and finding its feet a little more now with every episode. Would you agree? With the amount of publicity the show had initially, it was always going to take time with the huge expectation attached to a Marvel project. I think the scripts are getting better all the time. Hopefully people out there keep giving it a chance. We find out at the same time as everyone else about a second season. Until then we have no idea. We go back and we keep filming until April. So maybe then or afterwards. US network shows are a risky game. The Fades still has plenty of fans around who are disappointed it only had a single season before it was cancelled. Why do you think the BBC weren’t willing to continue with it? Oh, I wish I knew. It’s such a bittersweet thing to talk about, but really nice too. I still hear from a lot of fans about The Fades and I’m just really glad we had that time to make the show we did, and I’m very proud. Like with any show, the element of an origin story made it hard to get that over quickly with the audience. TV is a great medium performing at a high level and sometimes you just want to work on a show that has time to breathe and a longer whole season that doesn’t need to perform immediately in the ratings. Sometimes things can be approached in a different way. As well as S.H.I.E.L.D., you’ve been filming Ryan Gosling’s directorial debut How To Catch A Monster. What was he like to work with and what are the differences working on a big film compared to a TV show? Honestly working with Gosling was one of the greatest experiences I’ve ever had during my career. I can’t speak highly enough of him and I’m looking forward to seeing what people think of it. The medium isn’t necessarily something I’m focused on – just what it is and whether I like it or not. I’m really excited about the film. It’s very different to other work I’ve done, so it’ll be interesting to see. Not Another Happy Ending, starring Iain De Caestecker, Karen Gillan and Henry Ian Cusick, will be released on DVD on 10 February 2014. Iain also stars in the psychological horror In Fear, out on DVD and BluRay 10 March 2014.